Nepal is home to verdant valleys, rushing rivers, and blue lakes that originate in the Himalayas. The sight of these soaring mountains is a magnet for mountaineers and trekkers, offering some of the greatest physical challenges and most scenic hikes on earth. The diverse terrain of Nepal offers excellent opportunities for adventurous activities. Although mountain climbing and trekking are the most popular, there is also superb white water rafting on steep mountain rivers as well as elephant safaris or tiger tracking in the Royal Chitwan and Royal Bardia National Parks situated in the jungles of the Tarai belt. This abundance of natural attractions combines with cultural curiosities, including a wealth of temples and shrines, wonderful handicrafts, and colourful religious festivals. The Nepalese people are friendly and interesting, and offer a warm welcome to new arrivals. Thanks to popular literature and culture, Kathmandu has come to hold a certain mystique in the global imagination, serving as the gateway to Nepal for most visitors. Early spring (March and April) and late autumn (October and November) are the best times to visit Nepal, offering the clearest mountain views and good weather for trekking. Most travellers prefer to avoid the rainy monsoon season between June and September. Read more on Nepal's Climate and Weather. -Marvel at the magnificent 5th-century Swayambhu Stupa, one of the most sacred Buddhist sites in Nepal. -Explore the historic buildings and temples of Kathmandu's Durbar Square. -Visit the old royal cities of Patan and Bhaktapur in the Kathmandu Valley. -See the Pashupatinath Temple, one of the most famous Hindu shrines in the world. Read more on Nepal Attractions. -Go 'teahouse trekking' in the stunning Annapurna region. -Take an elephant-back safari to seek Bengal tigers in the Royal Chitwan National Park. -Hike to the Mount Everest base camp in the Himalayas. -Enjoy a multi-day white water rafting adventure from Pokhara. Read more on Nepal Activities. Nepal has become more accessible to tourists although most flights require transit in the Middle East or Asia. International flights land at Tribhuvan International Airport, situated four miles (6km) east of Kathmandu.Get more information on Nepal Airports. Into Thin Air: A Personal Account of the Mt. Everest Disaster by Jon Krakauer, The Snow Leopard by Peter Matthiessen, and Little Princes by Conor Grennan. Himalaya (1999), Little Buddha (1993), The Wildest Dream (2010), and The Golden Child (1986). Raksi (similar to tequila) and chiya (a milky, spiced tea similar to Indian chai). Momo (dumplings) and different varieties of the national dish, dal bhat, the basic ingredients of which are rice and lentil soup. Popular souvenirs from Nepal include tourmaline gems, pashmina shawls, prayer flags, and tea. Those wanting to experience Nepalese festivals should visit the country in late February and March, when Holi, the Festival of Colour, is celebrated, and Maha Shivaratri attracts millions of Hindu pilgrims to the Pashupati Temple. More information on Nepal Events. 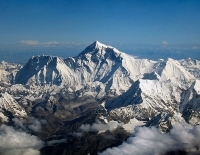 -The local name for Mount Everest is Sagarmatha, meaning 'goddess of the sky'. -Freak Street, in Kathmandu, was a famous hippie hangout in the 1960s and 1970s. -Eight of the world's highest mountain peaks are in Nepal. Combining an atmosphere of 'Never Ending Peace And Love' with some of the most breathtaking landscapes in the world, Nepal is a must for adventurous travellers.